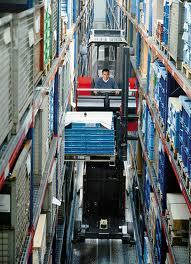 Forklifts are some of the most common industrial equipment in the world. They are used in industries ranging from steel to grocery stores and from ports to recycling centers. If the all of the world’s forklifts were to disappear, the global economy would stand still. So it’s interesting to take a look at the origins of the forklift truck and to see how it has evolved over the years. As the US economy blossomed through the 19th century and more goods were being produced, new means of moving these goods were being rapidly invented. Canals were prominent in the early and middle 1800’s until the faster and more efficient railroads took their place. And through the early part of the 20th century automobiles were quickly replacing horses. Along with these major changes in transportation, and the need for moving and storing the goods that the United States was becoming so good at producing, came the lift truck. Early lift trucks were basically a truck or tractor mounted hoist. These hoist trucks led to the development of electric platform trucks that were used by some of the railroads. World War I brought about more lift truck innovations as labor shortages and the need to move heavy materials encouraged manufacturers to be more creative. In 1917 Clark built the Tructractor, which is considered to be the first iteration of what we now call the modern sit-down forklift. The machine looked a lot like a riding lawn mower with a cargo bin on the front of it. This bin was manually loaded and unloaded and was used to move parts around the Clark manufacturing facility. Word spread of the usefulness of this little machine and other companies started asking Clark to make Tructractors for them too. In 1923 Yale built an electric truck with a mast that allowed the operator to raise and lower forks. Yale is considered the first producer of a lifting truck with forks. 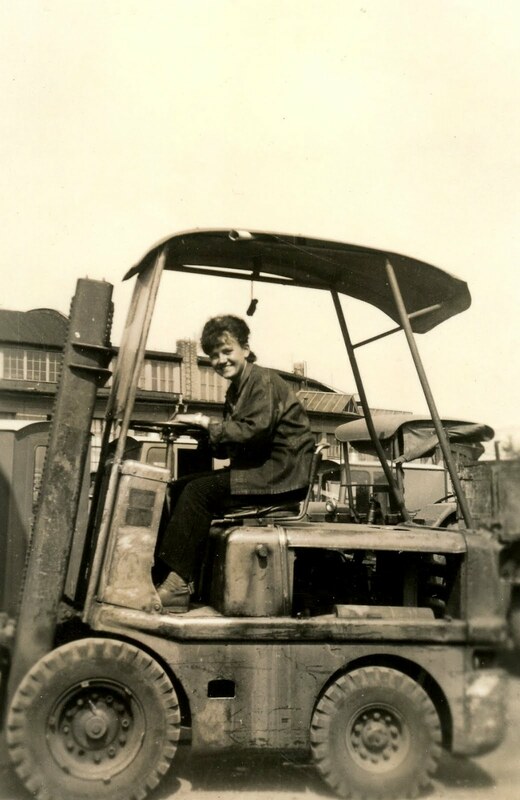 Other manufacturers such as Towmotor began making material handling machines around the end of World War I, and by the 1930s several competitors were building forklift trucks. 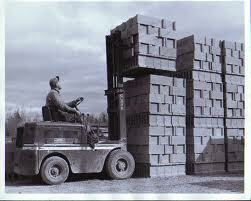 Two key events in the late 1930s and early 1940s led to a surge in the use and popularity of forklifts. The first was the development of the standardized pallet. The standardized pallet allowed loads to be stacked uniformly and moved safely and easily from place to place. The second was World War II. World War II required the US to manufacture war materials, implements, and machines and so forklifts were necessary for loading and unloading delivery trucks, planes, and for moving material around warehouses and manufacturing facilities. After World War II the growth in the use of forklifts followed the growth of the US and industrialized world’s economies. And today we see many different types of forklifts being used in warehouses, lumber yards, machine shops, manufacturing facilities and more. Lift truck capacities range from as little as a couple thousand pounds to over 100,000 pounds. And today’s forklifts can be very different from each other. As different as a very narrow aisle, very high lifting turret truck used in warehouses to a heavy duty, diesel powered, 60,000lb capacity steel coil handler. Whether it’s a used forklift that has been running around a shop for the last 20 years, or a brand new warehouse forklift with integrated computer systems, forklifts continue to be the machine of choice for moving and lifting heavy and cumbersome materials. Reblogged this on Michigan Forklift News.